Taxi Podgorica airport to Bar at the price of 40 Euros is best option of transportation from Podgorica airport, whether you come by business, or on holiday, in the city of Bar. 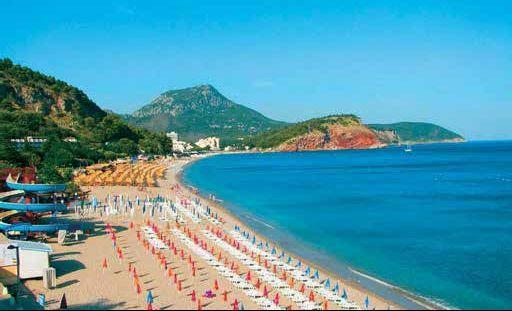 City of Bar is a port city in southern Montenegro, which in its hinterland have some of the most beautiful beaches on the Adriatic, which every year attracts many tourists who decide to spend their vacation on Bar Riviera. If your destination is Sutomore your travel cost are 35 Euros per vehicle. Taxi from Podgorica airport to Bar - Sutomore is often service which we are providing, because Sutomore, Dobre Vode, Veliki pijesak are just some of the many places on Bar Riviera, which are ideal for a holiday in the summer tourist season. Bar is one of the Mediterraneans sunniest cities, with more than 270 sunny days per year, and a large number of tourists know to use that on the right way. Transportation from Podgorica airport to Bar – Sutomore is often request in our company in April, May and also in September and October. In that period prices of accommodations are the lowest, and water is fresh and warm. Yacht marina in Bar become very popular, because of affordable prices and excellent service. Bar attract many tourists also because of old city, which is located 4 km outside city centre. The old town of Bar is the largest urban agglomeration among the ruins in Montenegro. Old olive tree is also famous tourist attraction and the symbol of the city, the oldest tree in Europe, old more than 2000 years. From Podgorica airport to Bar by taxi you will pass across the national park Skadar lake, through Sozina tunnel and via Sutomore. Sutomore is a small place, 5 km before Bar, and it belongs to Bar municipality. Taxi from Podgorica airport to Sutomore is also one of our often activities, because Sutomore has one of the largest sandy beaches in Montenegro. Old fortress Haj - Nehaj and nice long sandy beach, as well as huge capacity of cheap accommodation in private apartments, are the main reasons why Sutomore is very attractive tourist destination, and transfer from Podgorica airport to Sutomore by taxi is the best way of transportation. Dobre Vode and Veliki Pijesak are also small places, close to Bar, both with wonderful sandy beaches, also with a huge capacity of cheap accommodation in small hotels and private apartments. 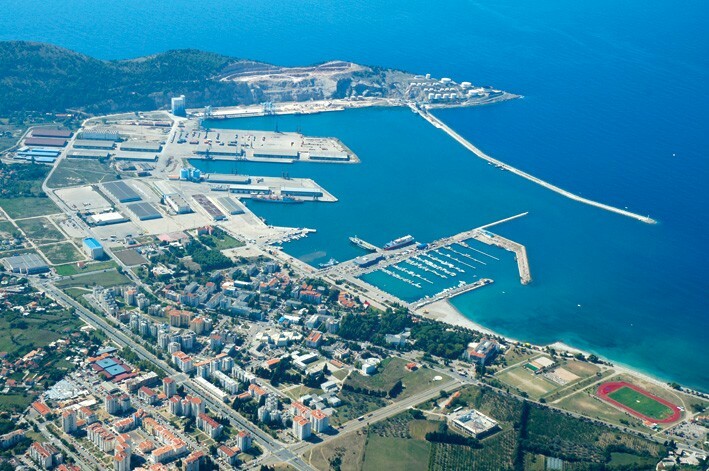 Taxi from Podgorica airport to Dobre Vode, Veliki Pijesak is also common need of a large number of tourist during the summer tourist season. Taxi from Podgorica airport to Sutomore cost 35 euros . That is a price per vehicle, 1-4 persons, and tunnel toll 5 euros is included in the price. Distance from Podgorica to Sutomore is 45 km, and ride takes about 40 min. 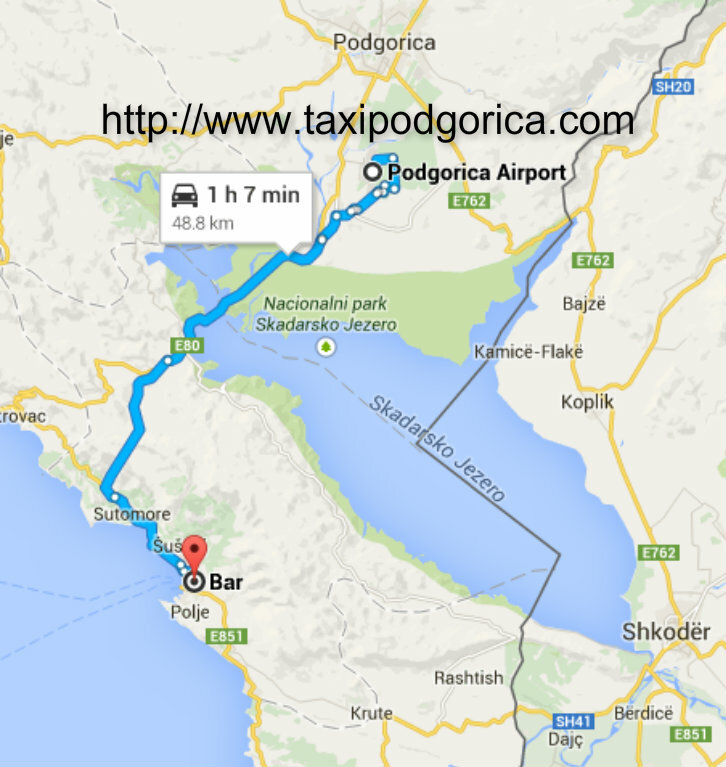 Transportation from Podgorica airport to Bar cost 40 euros. That is a price per vehicle 1-4 persons, and tunnel toll 5 euros is included in the price. Distance from Podgorica to Bar is 45 km, and ride takes about 50 min. You can contact our service 24/7, and we will responsibly arrange your transportation. Book in advance your reliable and cheap taxi Podgorica airport to Bar Sutomore, and our driver will wait for you at the airport, and provide you with an excellent service, in new and comfortable vehicles. This video down shows port of Bar, made by our airport taxi driver, and it is published on our official video channel.